As with the other wars that have been discussed in this series, the Native Americans answered the call to service without hesitation and in numbers per capita that were higher than any other ethnic group in the country. During the Vietnam War, close to 90% of the 86,000 Indians who enlisted volunteered, giving Native Americans the highest record of service per capita of any ethnic group. Over half served in combat. The Highground is honored to have been chosen as the home of The National Native American Vietnam Veterans Memorial. Unanimous approval for this decision was given at the annual Congress of Native American Indians held in Denver, CO in 1994. 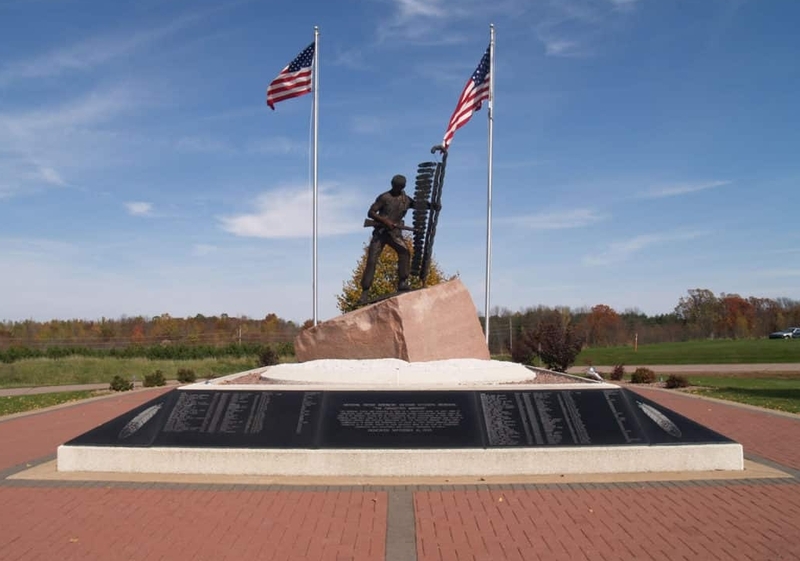 Dedicated in 1995, The National Native American Vietnam Veterans Memorial is the first national memorial to come to The Highground. Harry Whitehorse, Madison sculptor and WW II veteran, created this bronze sculpture. 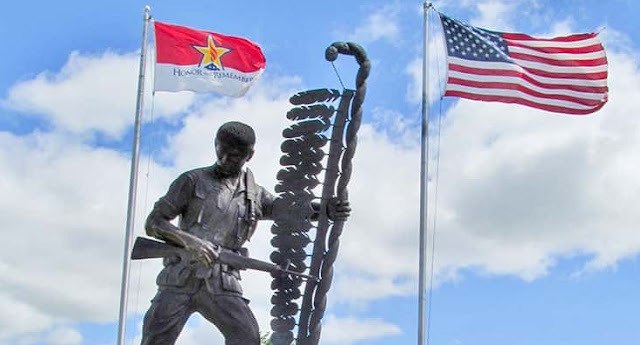 Mounted on a red granite base, the sculpture depicts an Native American Soldier in jungle fatigues, holding a rifle in one hand and an Eagle Feather Staff in the other. The names, rank, home of record, date of casualty-how they died (still to be completed is the tribal affiliation) of all Native American Indians who died as a result of the Vietnam war etched into two of the four black granite panels which skirt the base of the entire statuary. When we do tours we emphasize the importance of the Eagle Feather Staff. One of 42,000 Native Americans who served in the Vietnam War, Keel was awarded the Bronze Star with valor, two Purple Hearts, and numerous other awards for heroism. Responses to "Honoring Native American Vets on National Vietnam War Veterans Day"